Goa paints a romantic picture, with its stunning beaches and natural beauty coupled with exceptional dining and party venues. If you want to impress someone, the smallest state of India is the perfect place to be. However, simply grabbing a drink and taking a romantic stroll on the beach are run-of-the-mill type date ideas. Amp up your dating game and try something unusual that will score you a second date. Here’s a roundup of unusual date ideas to try in Goa. Instead of taking a leisurely stroll on the beach, why not board a river cruise and enjoy an amazing sunset instead? The lip-smacking Goan cuisine and live Goan cultural shows and folk dance performances aboard a sunset cruise are memorable. The Goa Tourism Development Corporation (GTDC) runs many river cruises along the Mandovi River. Goa is brimming with spas and massage salons, so you’ll be spoilt for choice. Book a couple’s rooms and enjoy some relaxing, soothing quality time with your date, surrounded by the pleasant smell of flowers and flickering candles that set a romantic scene. Some well-known spa centres in Goa are Jiva Spa, Zaara Spa and Sereno Spa. Jiva Spa, Taj Exotica, Goa. For a classy and utterly romantic date, dress up to the nines and head to the floating restaurant, Flor Do Mar, located on the calm waters of the Chapora River, near Morjim Village. Enjoy a sumptuous dinner along with champagne and candle light, a live band performance, and mesmerizing sea and sunset views. Rent some wheels and explore Goa at your own pace. Bike rentals are cheap in Goa at around INR 175- INR 250 (US$ 2- US$4) per day. Pop into one of many cafes and restaurants along the way, and stop at any interesting locales you come across. It sounds a bit cliché, but gazing at the stars together is utterly romantic. Head to one of the many secluded beaches in Goa, recline on the sand and connect with your date while marvelling at the sky speckled with twinkling stars. An added bonus is that this date idea doesn’t have to cost you anything. The most peaceful of Goa’s beaches are Hollant Beach, Betul Beach, Ashwem Beach, Butterfly Beach and Bogmalo Beach. This date idea is sure to be super fun, especially for nature fanatics. The Bhagwan Mahavir Wildlife Sanctuary, Cotigao Wildlife Sanctuary and Dr. Salim Ali Bird Sanctuary are perfect places to glimpse stunning local flora and fauna. You can even camp or enjoy a picnic lunch. Bhagwan Mahavir Wildlife Sanctuary, NH 4A, Caranzol, Goa. Add some adrenaline to your date by indulging in water sports like wake boarding, parasailing, banana boat riding, jet skiing, scuba diving, rafting, or kayaking. You can try a banana boat ride and parasailing at Mobor Beach, snorkeling and fishing at Coco Beach, rafting on the Valpoi River, and scuba diving and dolphin spotting at Grand Island. It’s best to go early (before 10 am) to avoid the busiest times of day. Follow these activities up with a nice brunch at one of the many shacks lining the beach. 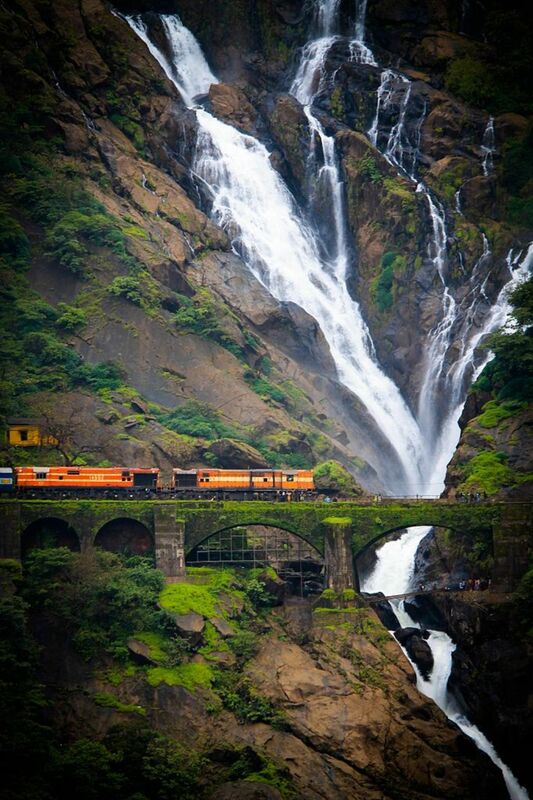 The white, milky water gushing from a height of 1,017 feet and surrounded by lush greenery is quite impressive. Trek to this awe-inspiring waterfall, and if you both have an appetite for adventure, hike up to the waterfall’s summit for impressive views. Goa is full of forts: spend some ‘we’ time at Sinquerim Fort, an architectural marvel at Sinquerim Beach that extends into the sea; enjoy mesmerizing views of the Arabian Sea at 17th century Aguada Fort; or spend an evening at the Mormugao Fort, situated at the mouth of the Zuari River. Aguada Fort, Fort Aguada Road, Candolim, Goa. A cave is definitely an unusual spot to go for a date, but Goa offers many opportunities. For instance, the Arvalem Caves are believed to have been carved out in the 6th century; the Rivona Caves feature Buddhist paintings and sculptures as well as beautiful laterite formations; and Lamgau Caves are home to elaborate carvings. The dark mystery of these caves may just help you get a bit closer to holding hands with your date. Arvalem Caves, Rudreshwar Colony, Sanquelim, Goa. Lamgau Caves, lamgao bicholim goa, lamgao, Bicholim, Goa.